There are have a few big things that have happened this year (like moving to Nashville from Missouri), but I have to say that my favorite thing that’s happened so far was the week we spent in Paris back in May. This trip was a total dream come true for me and is something I’ve been wanting to do ever since I was a little girl watching old movies like American in Paris and Funny Face. I’ve been wanting to make a Paris photo album, but with the move and settling in, I probably won’t be able to get to it anytime soon. So I thought I should at least make some photo art for the new house to remind me of our dreamy week in the city of lights. Paris is such a big experience, and I wanted to have a rather large reminder of our trip. So I settled on an oversized tiled photo from one of the pictures I took on the trip. We’re working with our good friends over at Canon USA on this post, and I’m using the new Canon PIXMA MG7720 Photo Printer, which is insanely easy to use. I’m not really the tech savvy one, and I got this set up at my new house all by myself, no problem. 🙂 Plus, as you can probably guess, the quality is always amazing and perfect for a project like this. So, first you’ll want to open your photo in whatever photo editing software you have (I’ll show you what I did in Photoshop) and crop your photo to a square. Go into “Image Size” and increase your photo resolution up to 300 dpi in 10% increments. So, if you start at 72, go up to 77 and hit OK, then up to 85 and hit OK, then up to 93, etc. until you get to 300. Repeat the process with the document size until you get to the overall size you want (mine is 38 inches). Use the ruler and guide lines to make a grid of your photo divided into as many equal sized squares as you want (just divide the final square width by how many squares you want to get how big the squares should be). Make sure that the size of the squares can fit on an 8.5” x 11” page if that’s the biggest your printer can print. Once your grid is made to the right dimensions, zoom in and use the rectangular marquee selection tool to select the area within one of the squares. Copy the selection and open a new document the size of your printer paper dimensions and paste the image onto that document. Print the document and continue to do that with each square until all the squares are printed. Print and lay out your tiles in order so you know what piece goes where, and mark a number at the top corner so you know where it goes in the picture. Use spray adhesive to attach the photo to the mat board and use an X-Acto knife and ruler to cut the photo out (you may need to create crop marks around some of the pictures before printing if the color is so light you can’t tell where the photo stops). Make sure to transfer the number to the back of the photo once it’s cut and use an arrow to show which way is up on numbers like “8” and “11”. Use thin washi tape to create a grid on your wall so you can see exactly where the tiles should go (use a level if you need to). Then mount each tile with either small nails or something like command strips on the back of each photo. Once your last photo tile is up, remove the tape and you’re ready to stand back and see the full picture! Incredible idea! Love the Parisian building!! Your lamp is also stunning! the buildings in paris are my absolute favorite. i may need to do this too! Wow. This is incredible. Absolutely love this idea. Very cool! Going to keep this in mind for when I have an empty wall to decorate! That’s such a cool idea! And it turns out looking like something overpriced that you’d buy in an art shop. I’m curious as to why the dpi is increased in small jumps rather than just straight to 300? I love the way this turned out! I’ll need to try this in our next apartment. What an amazing project and it looks bloody great too! Love this idea – I’m trying to pick an image I can try this with right now! Thanks for the inspiration! I love this project! Definitely want to try it with a favorite picture. Maybe to decorate my college dorm? Thanks for the inspiration! This is so fun! I’m definitely going to do this in my office space when we get it all put together! This is such a fun look! This is so gorgeous! Such a good idea. I will definitely try it! So fun! I used to go so many time at this place when i was living in Paris (for 15 years) So crazy! Happy you loved Paris!Your DIY is very cool by the way! I will mabe do one with a picture taken in Rome i love Sooooooooo much! It’s all about the details and the picture is just great. I was going to ask the same thing! What is the reason for it? And should I be going this for all the pictures that I print larger? I absolutely love this! I’ve been looking for something to put over our couch and I think this is the answer! Thanks for the tutorial! This looks like a lot of work but so worth it. I love the idea of using your favorite IG photo to create this piece on my wall. Love this! I’ve wanted to make a grid picture for awhile, but just haven’t gotten around to it. This looks so great! I like it! Very fun and exciting. This looks awesome! It’s so much more interesting than just a single picture. Maybe it would also look good with different pictures as tiles? I know you guys post a lot of projects you do with your canon printers. I love the way your projects turn out, and I know you always have such great reviews. But I wanted to ask about the printers longevity… you always seem to have a new printer every 6 months or so. Is that because you’ve got a great deal with Canon or because they only last that long and then need to be replaced? I have another brand photo printer that just bit the dust after not very long and my first choice replacement is the canon, but I don’t want to have the same issues I’ve had with a short lived photo printer. Thanks for asking & happy printer shopping! I feel affection for this project! Thanks for sharing this great idea & wonderful pictures. I will certainly try these tips. This looks stunning! I must try it. Funny Face is one of the best movies ever! 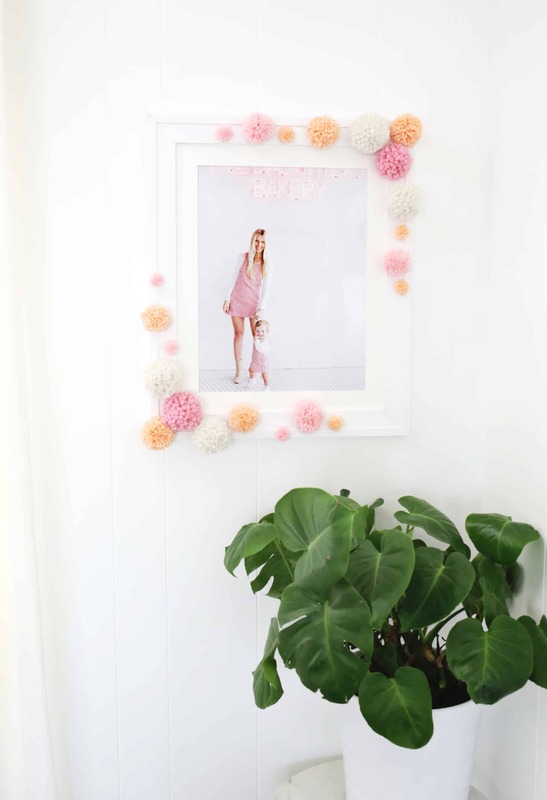 Love this way of approaching hanging a photo! I absolutely love this idea!! Such a fun and beautiful piece to add a little something something to bare walls! I love your blog! FYI Paris is not the “City of Lights” it’s the “City of Light”. E.g. not referring to the lights of the city, but the effervescent quality of the ambient light and sunlight that refracts off the hausmanian limestone, and the river. Hi! There is a free program call Rasterbator that makes that kind of up sizing of images and rasterization of images. check it out.